Villa Dreams is your destination to make an ordinary vacation extraordinary. Only a 10-minute drive from the ancient Greek city of Ephesus, this hotel features an outdoor pool with amazing views and plenty of space to relax and enjoy. 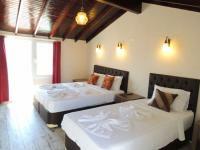 All rooms feature air conditioning, free wifi, and a private bathroom with shower and hairdryer. 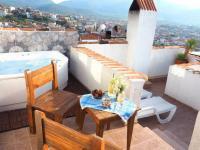 Most rooms are with a balcony overlooking the historical sites of St. John Church and the castle. Breakfast (included) is served each morning on the patio. Meals, snacks, and drinks are cooked to order and available all day. The rooms are characterized by simple and artistic ambiance, it has balcony with panoramic view to the castle and the Aegean Sea. 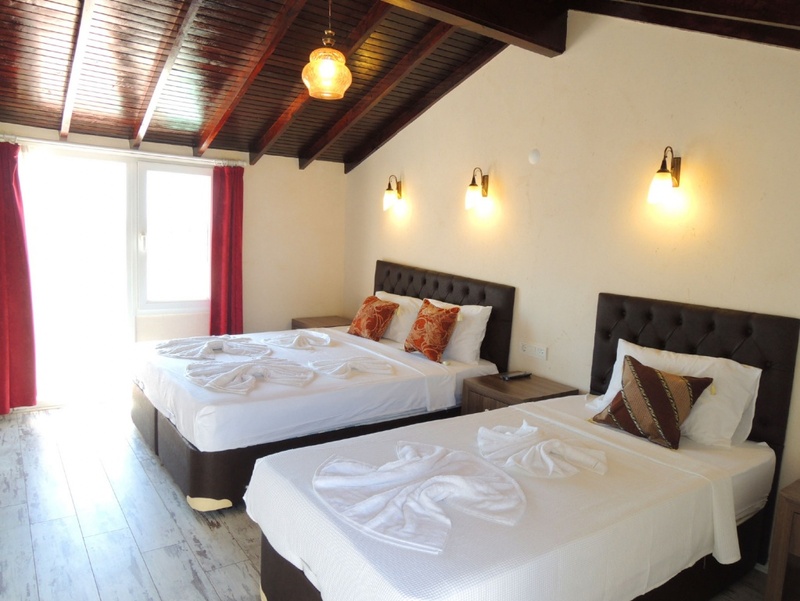 Fitted with wooden floors, all rooms include air conditioning, free wifi, TV, electric kettle, mini fridge, private bathroom with rainfall shower and hairdryer. Most importantly you will enjoy the warm Turkish hospitality. *Baby age 0 to 2 years old are free of charge. Children age 3 to 5 years old who share the bed with adults are free of charge, maximum free for 1 children in these ages in one room. 6 years old or above have to be counted as adult price. 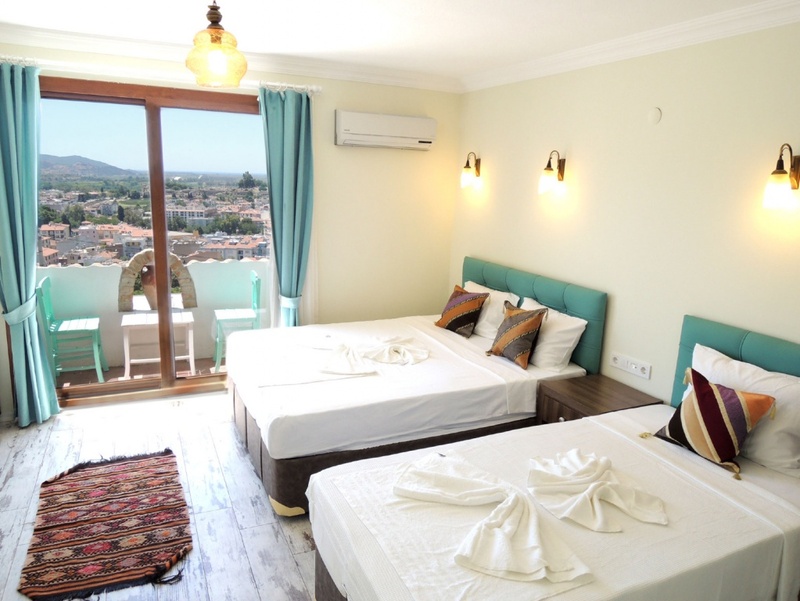 The room is characterized by simple luxury and artistic ambiance, it has 2 balconies with panoramic view to the castle and the Aegean Sea as well as mountains. 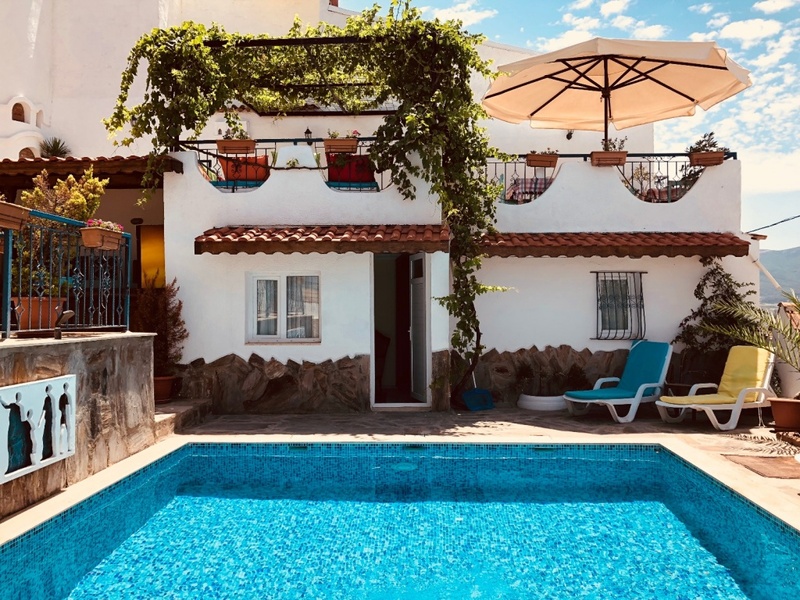 Fitted with wooden floors, it includes air conditioning, central heating, free internet access, electric kettle, mini fridge, a hot tub on the balcony with amazing view, private bathroom with free toiletries and hairdryer. Most importantly you will enjoy the warm Turkish hospitality. 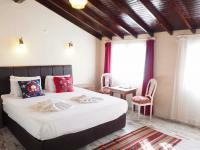 *Extra bed is applicable in this room for €15 per night including breakfast., place remark in your booking request. 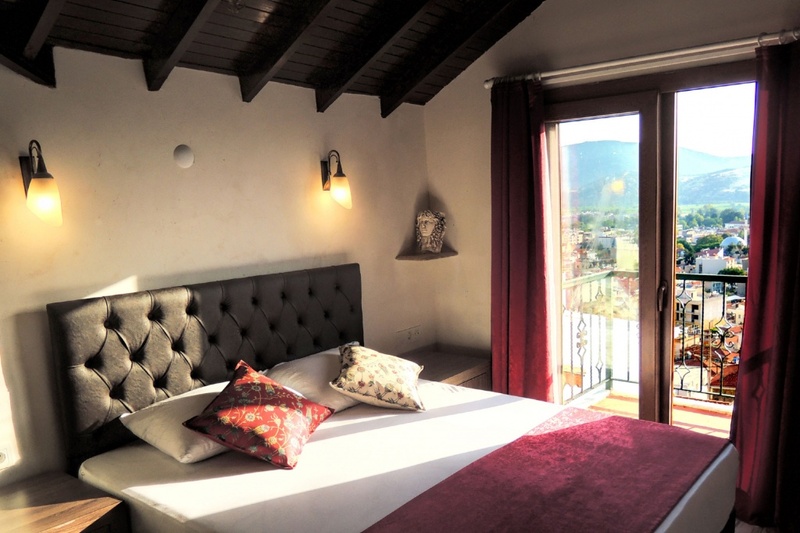 The rooms are on the 1st and 2nd floor, both are characterized by simple and artistic ambiance, one has view to the garden and the castle while one has the view to the mountains. Fitted with laminate floors, it includes air conditioning, central heating, electric kettle, mini fridge, free wifi internet access, private bathroom with rainfall shower and hairdryer. It contains 2 single beds for 2 people. 2 beds can be combined into a large double if you like. 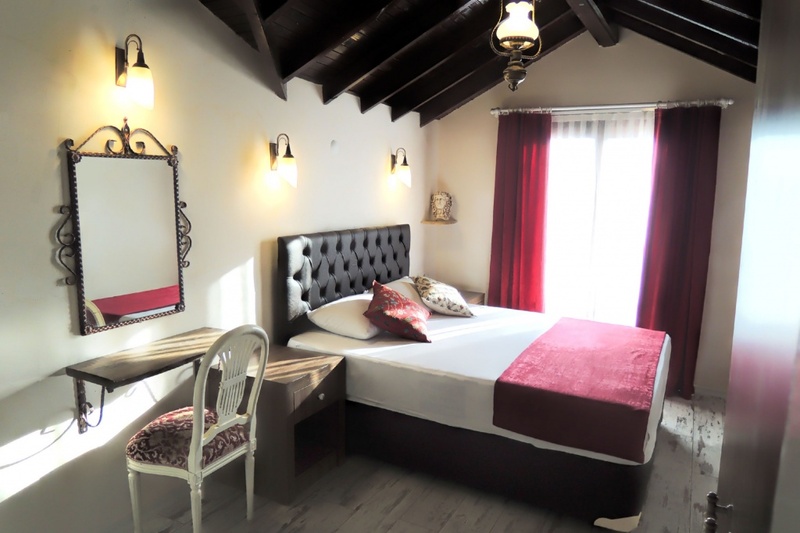 It is possible to add extra bed at 12 Euros for extra person in the 1st floor room only. Breakfast is included. Baby cot is available free of charge, please tell us in advance so we can arrange for it. 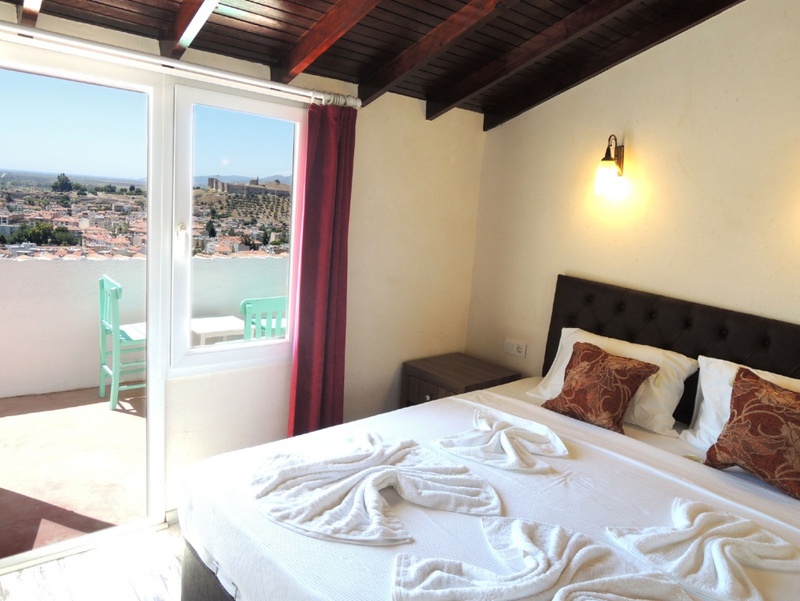 The room is characterised by simple and artistic ambiance, it has balcony with panoramic view to the castle and the Aegean Sea. 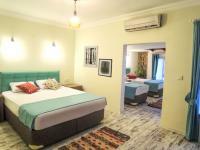 It contains 1 double bed and 2 single beds for 4 people. 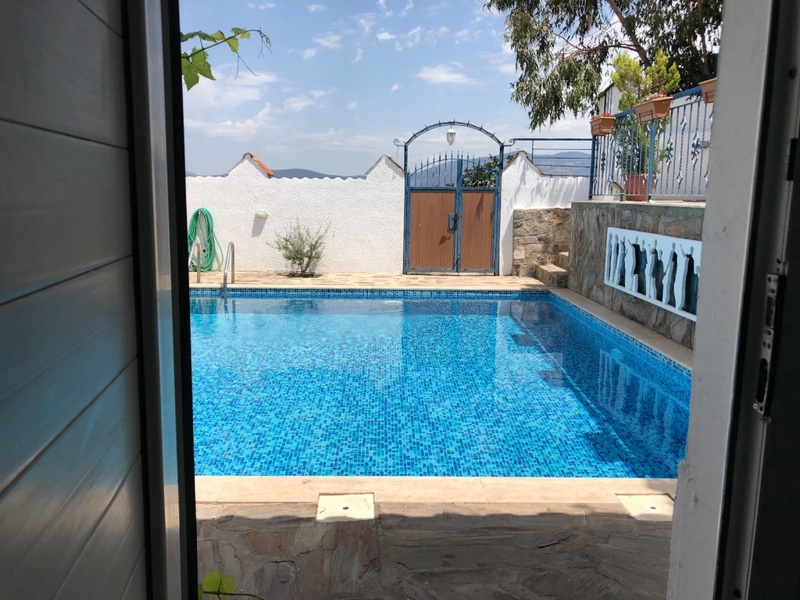 Fitted with wooden floors, it includes air conditioning, free wifi, TV, electric kettle, mini fridge, private bathroom with free toiletries and hairdryer. Most importantly you will enjoy the warm Turkish hospitality. 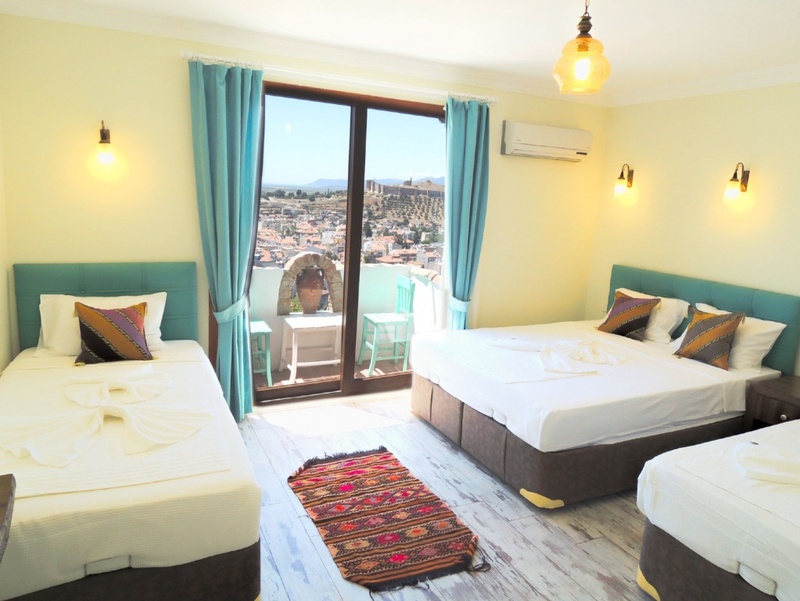 The room is characterized by simple and artistic ambiance, it has 2 balconies with panoramic view to the castle and the Aegean Sea as well as the mountains. It contains 1 double bed and 1 single bed for 3 persons. Fitted with wooden floors, it includes air conditioning, free wifi, TV, electric kettle, mini fridge, private bathroom with rainfall shower and hairdryer. Most importantly you will enjoy the warm Turkish hospitality. *Extra bed is not applicable in this room. 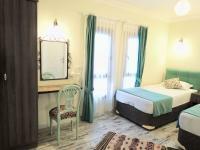 It contains 1 double bed and 2 single beds for 4 people. Fitted with wooden floors, all rooms include air conditioning, central heating, free wifi, TV, electric kettle, mini fridge, private bathroom with rainfall shower and hairdryer. Most importantly you will enjoy the warm Turkish hospitality. *Extra bed is applicable in this room for €12 per night including breakfast., place remark in your booking request. Breakfast is included. The rooms are characterized by simple and artistic ambiance, it has separated seating area and bedroom, with ensuite bathroom. The bedroom has the view of the castle. It is located beside the swimming pool, with immedate access to the pool at the front door. Fitted with lamiate floors, all rooms include air conditioning, free wifi, TV, electric kettle, mini fridge, private bathroom with shower and hairdryer. Most importantly you will enjoy the warm Turkish hospitality. Only a 10-minute drive from the ancient Greek city of Ephesus, Villa Dreams rests upon the hillside overlooking the picturesque town of Selçuk. With panoramic views, you will have the best spot in town to watch the sunset behind the historic Ottoman castle. 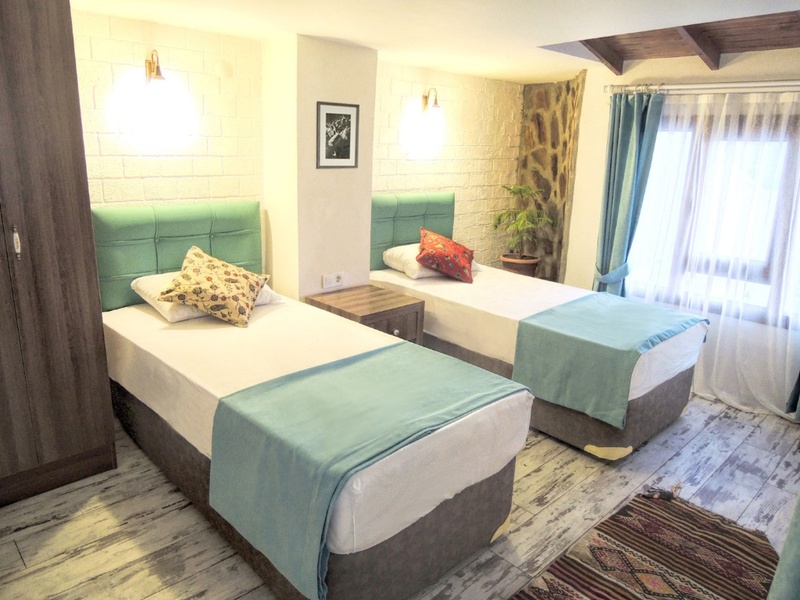 It is located 2 minutes drive or 15 minutes walk from the town center, in close proximity to the beach (8km) and many historical sites: 4km - Ephesus, 10km - House of the Virgin Mary, 8km - historical village of Sirince, 48km Dilek National Park. Izmir Airport is a 50-minute drive. Breakfast (included) is served each morning on the patio. Snacks and drinks are cooked to order and available all day. Food delivery from town can be arranged. Closest restaurant is 500m away. 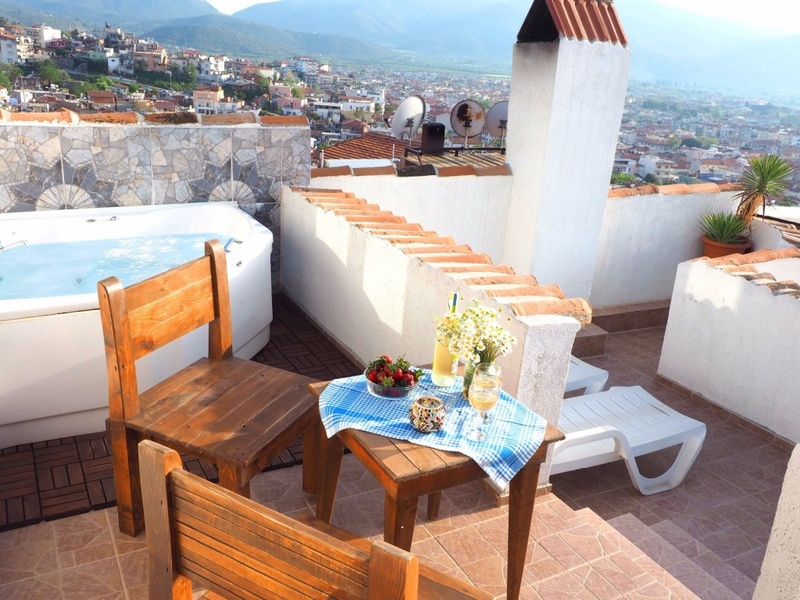 Villa Dreams features outdoor pool and patio with panoramic views, you will have the best spot in town to watch the sunset behind the historic Ottoman castle. Hiking and jogging around the hills are wonderful experience with the nature.